June 11 (Bloomberg) -- A stabbing pain in the hip forced Mark Hirschbeck to abandon his post at third base during an April 2003 game between the Arizona Diamondbacks and the Colorado Rockies. 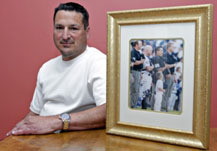 He was 42, among the best umpires in professional baseball and unwilling to quit a job that paid more than $350,000 a year. Dr. John Keggi offered a hip replacement that could get him back on the field by 2004, Hirschbeck says. That didn't happen. The ceramic joint made by Wright Medical Group Inc. shattered, leading to an infection and four more surgeries that left Hirschbeck permanently sidelined. He later learned that Wright paid tens of thousands of dollars to a foundation Keggi helps run and gave him a trip to a conference in the Bahamas. Keggi recommended the ceramic device over the kinds of implants used in 97 percent of cases. "He was in bed with Wright and picked their product," says Hirschbeck, who is suing the company and the surgeon, alleging Wright's product was defective and Keggi failed to install it correctly. "It's disgusting it would come to that." Wright's professional agreements with surgeons are under investigation by the Justice Department, according to filings with the Securities and Exchange Commission. It's not clear whether the payments to Keggi were improper or are being examined by prosecutors, who declined to comment. The company and the doctor have denied the allegations in the umpire's suit. The government declared last year that it had overhauled the financial relationships between surgeons and the biggest makers of knees and hips, saying the threat of criminal prosecution for "kickbacks" had forced them to slash payments to physicians. Results of the crackdown were "truly extraordinary," said Christopher Christie, a former U.S. attorney for New Jersey who is now governor, in testimony to Congress in June 2009. "It's back to business as usual," says Charles D. Rosen, president of the Association for Medical Ethics, who is a spine surgeon in Irvine, California. "Nothing will change until someone goes to jail. It's a big game." Prosecutors in the New Jersey U.S. Attorney's Office, which headed the case, reported a "satisfactory completion" in March 2009 of the probe of Biomet Corp., Johnson & Johnson's DePuy unit, Smith & Nephew PLC, Zimmer Holdings Inc. and Stryker Corp. Payments in 2008 fell to $105 million from $272 million the year before, the Justice Department lawyers said. The companies increased doctor compensation for 2008 to about $300 million, according to the data compiled by Bloomberg from reports posted on the device makers' websites. Fees for 2008 were delivered in 2009, the surgeons say. Payment delays were "a common happenstance," says Teresa Ford, a Seattle attorney who represents 150 doctors who have consulting or royalty agreements with orthopedic device makers. "None of them had significant changes in their relationships." The government numbers were lower than those reported by the companies because Justice Department officials didn't count payments made to buy out the consulting contracts of some physicians, says Michael Drewniak, a spokesman for Christie, a Republican who resigned in December 2008 to run for governor. A "large number" of implant makers paid to end multiyear arrangements, Drewniak says, because they might not comply with new standards under the settlement. "We weren't just making up numbers," Drewniak says. The reports on the company websites don't specify whether any payments were to buy out contracts. The payments show how hard it is for government to hold down costs in a system where pricing is opaque and largely unregulated. In the $14 billion-a-year orthopedic device business, payments to doctors squelch competition, says Chad Rodine, a partner in Castle Rock, Colorado-based Echelon Consulting LLC, which advises hospitals on implant costs. Hip and knee list prices have increased 5.6 percent so far this year, on top of a 130 percent increase in the average selling price of a hip between 1996 and 2008, according to Orthopedic Network News, a trade journal that tracks costs. "These items are ridiculously expensive, and a lot of the monies in that bucket are to keep the surgeon tied to that product," Rodine says. He figures about half the price charged for devices can be traced to funds companies pour into persuading doctors to pick their goods. Device makers work to form bonds early, in medical school, where they underwrite residency programs, or buy books, or sponsor fellowships. Later, they pay surgeons as consultants, speakers or instructors. Company sales representatives attend operations. The reps enjoy wide access to surgeons at a time when some hospitals are moving to limit the interactions that pharmaceutical representatives have with doctors. Academic medical centers, including Stanford University and Yale University, restrict when and where drug company salespeople can visit doctors, and ban them from patient areas. The connection between device makers and surgeons is hard to break, says Jeffrey Lerner, chief executive officer of the ECRI Institute in Plymouth Meeting, Pennsylvania, which collects pricing data. "The relationship between the manufacturer and surgeon is so deep," Lerner says. "The first thing they want to see when they pull into the hospital in the morning is their manufacturer representative's car." As joint replacements became more complex and numerous, implant makers increasingly relied on surgeons to help them develop new products and train colleagues. Physicians became involved in testing new implants. "Engineers don't know how to do it," says Joseph Zuckerman, an orthopedic surgeon at NYU Langone Medical Center who has worked as a consultant. "Advances in the design of orthopedic devices would not be possible if physicians were not part of the development process." Along the way, according to government investigators, the system was perverted so that many consulting deals, royalty agreements and trips to conferences were intended not to develop better products but to persuade surgeons to use a company's products. The government charged that the industry "routinely violated the anti-kickback statute by paying physicians for the purpose of exclusively using their products." Federal prosecutors began looking into the incentives in 2005. The government's settlement was with the five companies that make 95 percent of artificial hips and knees. They agreed to an 18-month monitoring plan. Four of the producers also paid $311 million in fines to settle civil complaints filed under the Federal False Claims Act. Stryker was monitored, not fined. As for 2008 fees that weren't delivered until 2009, three of the companies say they froze payments while monitors were reviewing contracts with surgeons to ensure they were proper. Spokesmen for Stryker and Smith & Nephew declined to comment. Three of the court-appointed monitors say they're barred from talking about the details of their work. The two others, including former U.S. Attorney General John Ashcroft, didn't return telephone calls. The department declined to release reports the monitors filed. A month after the government closed its case, Zimmer CEO David Dvorak told analysts on a conference call that the action didn't result in a "material change" to what it pays surgeons. Warsaw, Indiana-based Zimmer is the largest implant maker, with 2009 revenue of $4 billion. Christie was criticized by some members of Congress for appointing Ashcroft, his one-time boss, to monitor Zimmer. Zimmer said then that it would have to pay Ashcroft's consulting firm as much as $52 million, and complained about the amount. The biggest change from the settlement is more paperwork, surgeons say, because they have to document in greater detail the work they do. Some say companies have been stricter with entertainment expenses and have cut the number of meetings at resort locations. "No one is really paying the price," says U.S. Representative Bill Pascrell Jr., a Democrat from New Jersey. Deferred prosecution deals "don't work." In June 2003, Hirschbeck says, a Wright salesman was in the operating theater when his ceramic hip was installed at Waterbury Hospital in Connecticut, which the former umpire says he was stunned to learn later. "I didn't know this guy," he says. "What right does he have to be there?" Back then, Hirschbeck says, he knew next to nothing about artificial implants or the companies that make them. Stout, of medium height and with a fondness for flat-top haircuts, he loved his job, and just wanted to find a way to do it pain-free. He'd had his moments in the baseball sun. He umpired two World Series, including in 2001 when he became part of the story in game 2 between the New York Yankees and the Diamondbacks. In the 8th inning, Hirschbeck called Yankees third baseman Scott Brosius out on strikes. The Yankees were being shut out. An irate Brosius was soon in Hirschbeck's face, and a photo of the confrontation ran in sports pages. "I was about to throw him out," says Hirschbeck, whose brother John is also a Major League umpire. He didn't. Brosius backed off and the Yankees lost the game 4-0 and the series 4 games to 3. "It was the most pressure I ever felt. One bad call could ruin your entire winter." After joining the major leagues following an eight-year tour in the minors, he was reaping the rewards. But getting into position behind home plate was starting to mean a jolt of piercing pain in his hip, he says, akin to being stabbed with a sharp knife. Cortisone shots provided temporary relief. Then pain forced him off the field in Phoenix, and he started doing his homework on orthopedic surgeons. His choice of John Keggi of Middlebury, Connecticut, was motivated not just by Keggi's reputation -- "I heard he was the best in the state," Hirschbeck says -- but by the notion that he could recuperate close his own home in Shelton, Connecticut. While some others recommended metal implants, Hirschbeck says Keggi pushed a new ceramic hip from Wright. "I will have you back on the field within a year," Hirschbeck says Keggi told him. Keggi, in a deposition taken in Hirschbeck's lawsuit, said he told Hirschbeck the replacement "may allow you to return to work" and that the ceramic hip "had the best chance of lasting the longest." Less than two months after surgery, Hirschbeck was on the couch, watching TV, when he heard a pop. The pain was intense; the hip had shattered. On July 26, Keggi opened the patient up, picked out the splintered pieces and installed another ceramic implant. Within a month, Hirschbeck was back on the table. This time, an infection had developed; Keggi washed the joint out and removed infected tissue. The pain didn't go away, Hirschbeck says, and he his wife decided to seek out a new doctor, visiting the Hospital for Special Surgery in New York City, which performs the most replacements in the U.S.
A specialist there told Hirschbeck his hip was infected, he says, and delivered an additional jolt of bad news: Fixing the problem would mean taking out the joint and putting in a temporary spacer loaded with antibiotics. That would stay in until the infection cleared. Hirschbeck consented. For all of September and most of October in 2004, he lay in a hospital bed in the family room. Nurses visited daily to administer additional antibiotics. His wife emptied his bed pan. When he returned to New York in the back of his van in late October to receive yet another hip, he got a combination of components from Zimmer and Waldemar Link GmbH & Co. That operation, his fifth in 16 months, was successful. There are an estimated 80,000 revisions of hip and knee replacements in the U.S. each year in which an artificial joint is removed because it is causing pain, became loose, failed or is limiting a patient's mobility, according to a study published in 2007 in the Journal of Bone & Joint Surgery. The bill for all his repairs was $344,813, Hirschbeck says, mostly covered by workers' compensation. In September 2005, Hirschbeck sued Keggi and Wright in Connecticut Superior Court. Keggi's lawyer, Eugene Cooney, says in an e-mail that his client "has denied these claims and intends to fight them." Keggi declined to comment. Officials with Wright, which has denied liability, won't answer questions about Keggi, Hirschbeck or its products while the suit is pending, according to Tom McAllister, assistant general counsel for the Arlington, Tennessee-based company. It's the sixth-largest hip and knee maker, with revenue of $487.5 million last year. Wright is "cooperating fully" with the Justice Department probe that began with a December 2007 subpoena, according to a May 5 filing with the SEC. It's "probable" there will be a settlement that may require a payment of about $8 million, the company says in the filing. Keggi, in a deposition, said Wright had given grant money, though he didn't know how much, to the Keggi Orthopaedic Foundation, where he said he is director of research and his uncle, Kristaps Keggi, is president. "The Keggi foundation was paid nominal sums by various product manufacturers to collect data on the results of hip replacement surgeries," Cooney says. Keggi and his uncle, also an orthopedic surgeon, jointly owned the practice at the time of Hirschbeck's ceramic implant. Kristaps Keggi was a clinical investigator for the trial by Wright to get its ceramic hip approved for sale in the U.S. The Wright website features testimonials from two patients of Kristaps Keggi touting the company's ceramic hip. John Keggi said in his deposition that he attended a Wright conference in the Bahamas and brought his wife. He couldn't remember the dates or details, according to his deposition. Keggi said the Wright salesman at the time for Connecticut, Scott Fitzgerald, was usually in the operating room to instruct him on the installation of implants. In his deposition, Fitzgerald said that before joining Wright, he had worked in the ski industry and sold outdoor power equipment. Keggi no longer uses the Wright ceramic hip, having switched to a joint made by Smith & Nephew, he said in his deposition. Last year, Smith & Nephew paid Keggi $25,001 to $50,000 for consulting work and reimbursed him for $7,061 in travel and meal expenses, according to financial records posted on the company website. The company's physician-consultants are "compensated fairly" and their input is "central to the development and introduction of new orthopedic medical device technology," says Andrew Burns, a spokesman for London-based Smith & Nephew, in an e-mail. The company is the fourth largest hip and knee maker with revenue of $3.8 billion last year. In Ansonia, Connecticut, Hirschbeck lives alone, collecting disability from the league, about 40 percent of his former pay. His marriage ended in divorce, partly, he says, because of the stress of his multiple surgeries. "I'm miserable," he says. "It screwed up my life big- time."